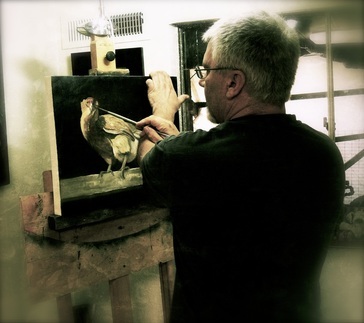 M﻿y name is Jeff Watts; I’m an artist living in Forestville, California. While I strive for a sense of realism in my paintings, I always want the viewer to know they are looking at a painting. The simple answer is; I have no goats. A little bit more of the story....... When we left San Francisco and moved to the country, the plan was to get a few goats and maybe some chickens… We were going to have fresh eggs and make our own goat cheese…fun, right? Well after we bought a house on a hillside in Sonoma County, I bought a book about tending goats and making cheese. It turns out to be a lot more work and time than I have to offer. So here I am with my studio, on a hill with no goats. Eleven years later on No Goat Hill, we now have chickens…four lovely little hens, who are now laying eggs. .
welsh terrier-Cooper oil on panel 5"x7"
Pets have become such an important part of our lives and a portrait is beautiful way to celebrate that bond or honor an old friend. The very nature of the oils and brush marks of the paint breathe life into a portrait. There is a presence and character to a painting that can’t be achieved with a photograph.